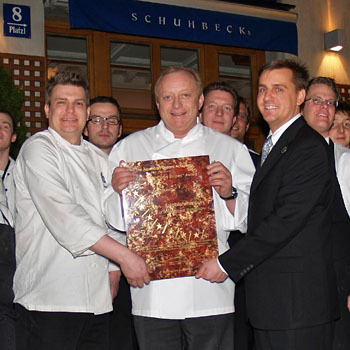 With a king-sized persona, Alfons Schuhbeck is literally a household word in Germany as he appears in cooking shows frequently on national Television and has written over 20 books. It was under Alfons's tutelage that Executive Chef Patrick Raass came into his own to take over the reigns in the kitchen, working hard to emulate his mentor, all the while keeping his own creative streak intact. Stepping into the restaurant off the busy Platzl is like entering an entertainment zone. Crafty photos of Alfons are shown in every conceivable situation working his magic, even in the restrooms. Restaurant manager Wolfgang Hirn welcomed us with true southern hospitality and guided us to our reserved table for the evening. Soon, you will be able apply for our Seven Stars Global Elite Travel and Dining program. 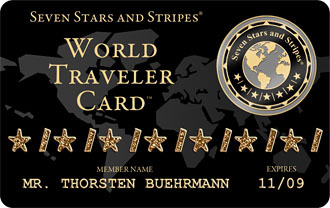 As the carrier of our global Seven Stars Black Card you will receive extraordinary benefits, all over the world, at participating Seven Stars and Stripes Award winning establishments. 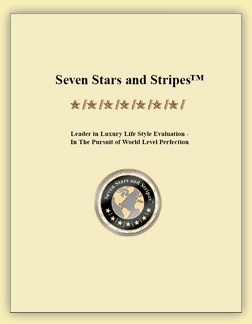 Granted to Elite Seven Stars Black Card Members Only. Hello again my traveling friends and happy Valentines. February is the month of love; almost the end of winter and 2008 is a leap year, which gives us an extra travel day! I can feel that spring is right around the corner! Woo hoo! Shaking of the winter blues is important, and the best way to do this is to hide away in a world-renowned, recognized luxurious spa for at least a week. We are introducing the Seven Stars and Stripes Global Spa Award for the first time next month at the ITB (International Travel Show Berlin) and are delighted to welcome distinguished spa expert Ming W. Teh to our advisory board. We are also saluting Celebrity Chef & Restaurateur Heinz Winkler of Germany, GM Martin Schneck of Fairplay Golf Hotel & Spa Spain, Marketing & Asia Expert Albert Stienissen of Africa, GM Sjefke Jansen of The Oberoi Mauritius, GM and Regional Director Bernhard Loew of the Schlossle Group and Executive Chef Wolfgang Fischer of the Emirates Palace, U.A.E. 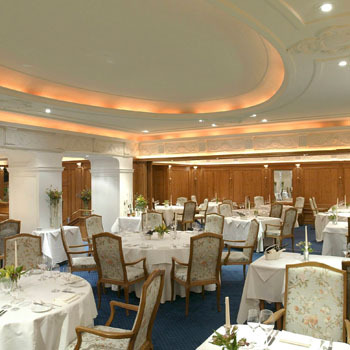 Oh, and if you are flying over Munich, be sure to reserve a table in advance at Schuhbeck's in den Südtiroler Stuben, and you can unmistakably expect the cutting edge of culinary greatness. 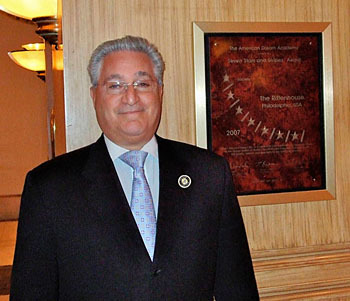 The Seven Stars and Stripes' research and development department, inspired by Advisory Board Member David Benton, created a new face for the world's highest hospitality award plaque. A matching golden frame, produced by a German manufacturer, enhances the golden stars and stripes. 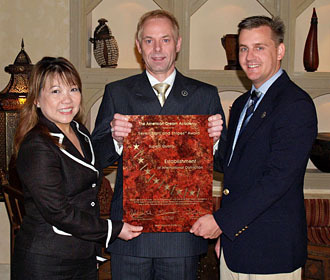 Featuring General Manager Siefke Jansen with the new award frame design at The Oberoi Mauritius and below GM David Benton at The Rittenhouse in Philadelphia, USA. 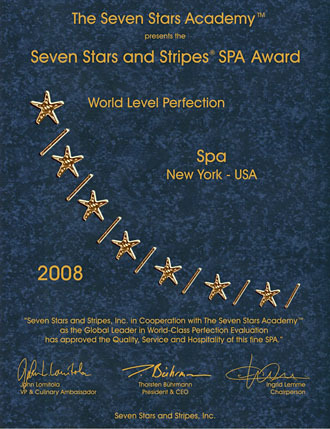 The global Seven Stars and Stripes Destination Spa Award team reviews and recognizes the worlds leading full service spa facilities annually. 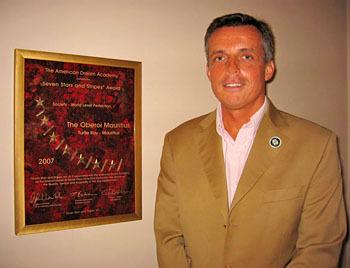 Only desination spas will be considered for the highest, international spa recognition.